Above: The Sawtooth Mountains invite exploration. Photographs by Jay Hemphill. AMONG 7,000 SQUARE MILES of gorgeous scenery with fewer than 4,000 people, you’re bound to find a few recreational temptations. On that score, Catron County delivers. The Continental Divide stretches through the region, trailing up and down a dozen forested 9,000- to 11,000-foot mountain peaks. Ancient volcanoes left deep craters, huge lava flows, and thick ash beds. And if that isn’t tempting enough, the 60-mile-long, 20-mile-wide Plains of San Agustin represent one of the biggest stretches of wide-open spaces in the intermountain West. Despite the high-desert landscape, water delivers a powerful presence. Deep canyons shelter miles of riparian oases along Apache Creek and the Tularosa River. Cottonwood, willow, box elder, walnut, and oak trees create brilliant spring greens and autumnal fireworks. Large tracts of the Gila, Apache, and Cíbola National Forests, as well as Bureau of Land Management and state lands, make this ideal for Sunday drivers, hikers, campers, and even those who seek cabin and café amenities at the end of the day. Remote as the area feels, it benefits from well-maintained, lightly traveled highways and county roads that form a lopsided triangle, starting with Datil on the east, then Quemado to the northwest (via Pie Town), Reserve to the south, and back to Datil. Both US 60 between Datil and Quemado and NM 12 to Reserve cross the Continental Divide and provide access to the newly established Continental Divide National Scenic Trail (see “Where Angels Tread”). They also follow two branches of the old Hoof Highway, which served as the last open-range stock driveway in the West until the mid-1900s. Ready? Let’s drive! From Datil, US 60 follows the northern branch of the Hoof Highway through a long valley in the Datil, Crosby, and Sawtooth Mountains. 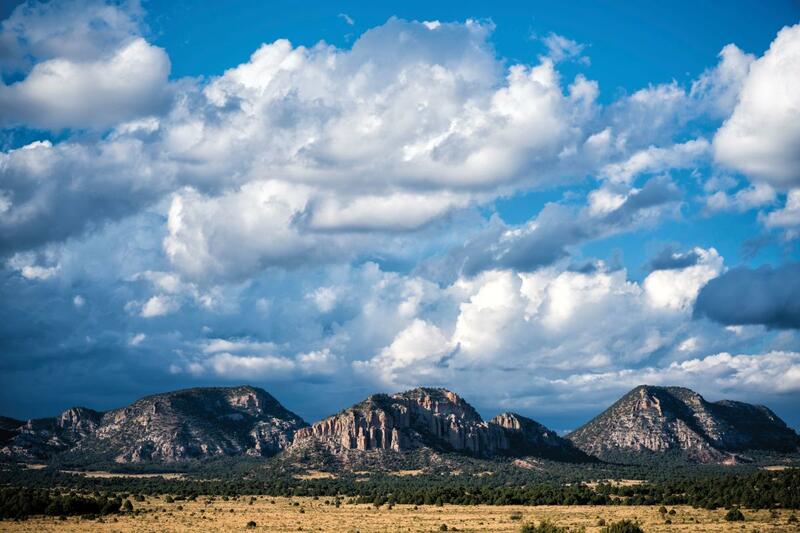 Cíbola National Forest roads lead north to one of New Mexico’s best-kept secrets: Monument Rock. This dramatic, cylindrical formation is surrounded by the precipitous, jagged 8,500-foot peaks that give the surrounding Sawtooth Range its name. Hikers can wander a network of two-track trails through a fantastic world of spires, knife-edge fins, and arches marked by prominent, undulating layers exposed by an earthquake 60 million years ago. Narrow, shaded canyons guard old-growth piñons, alligator junipers, ponderosa pines, Douglas firs, and rare limber pines. Above: Pie Town&apos;s cafés are generally open from spring to the winter holidays. US 60 continues west across the Continental Divide to Pie Town, a good place to treat yourself after an excursion, and another 23 miles to the Mangas Road junction near tiny Omega. 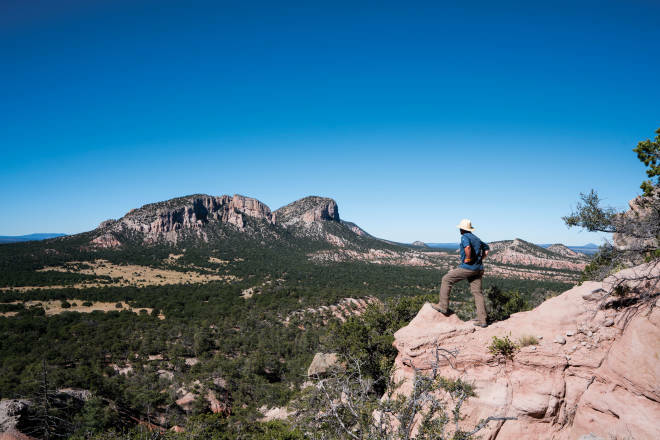 Here, you could either keep driving through grasslands punctuated by solitary volcanic buttes to Quemado for the night or consider a side trip from the Mangas Road junction to a historic fire lookout. A detour off Catron County’s paved highways onto Mangas Road reveals more of the Gila National Forest. Paralleling forested peaks, this well-maintained gravel road (also called CR A095, CR 214, and, at its southern reach, NM 93) provides a 32-mile, north–south shortcut from just east of Omega on US 60 to Apache Creek on NM 12. In the late 1800s, legendary Apache leaders Geronimo and Mangas Coloradas used this isolated country as the last stand for their tribe’s resistance. 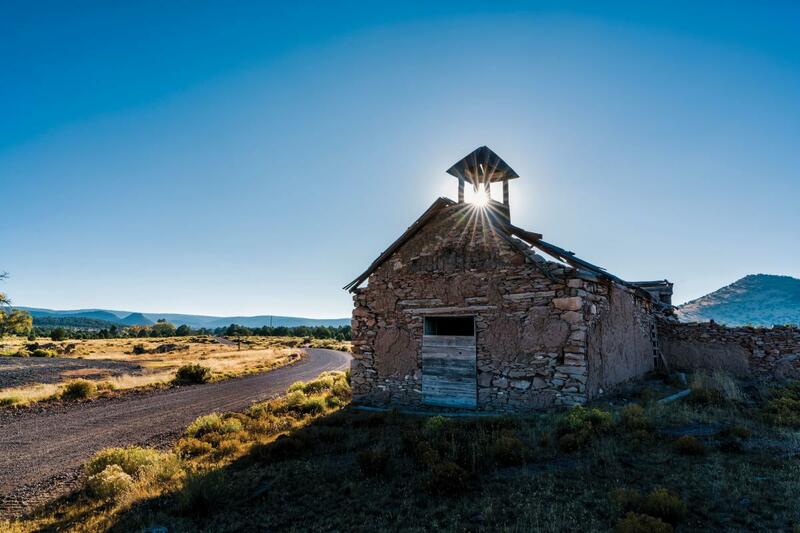 About 15 miles south, you’ll drive through the abandoned town of Mangas—just a few crumbling buildings on private land. Another 12 miles south, the road crosses the Divide and enters the Gila National Forest. Park at the primitive Valle Tio Vences Campground to take the Continental Divide Trail four miles east and up 1,500 feet to the historic Mangas Fire Lookout. Perched on 9,691-foot Mangas Peak, the lookout tower, a 1930s WPA project, graces visitors with a panoramic view stretching 200 miles from the Arizona state line to Sierra Blanca, near Ruidoso. Above: A handful of ruins mark the ghost town of Mangas. West of Quemado off US 60, two neighboring BLM wilderness study areas—the 44,000-acre Eagle Peak and the 16,000-acre Mesita Blanca—provide hiking trails through badlands. The two areas’ centerpieces, Cerro Pomo and Red Hill Cinder Cone, exploded violently to the west, creating giant ash beds and lava flows that have eroded into phantasmagorical hoodoo gardens. Lavishly textured black gargoyles of every conceivable shape, some more than 30 feet tall, suggest a journey through Hades. Cerro Pomo, which you can reach in about 13 miles on the unpaved CR A7, is the more impressive of the two cones but requires a longer, tricky cross-country trek best left to experienced hikers. Red Hill Cone offers extensive and easy-to-reach hoodoo fields. To find its parking area, drive another four miles past the CR A7 junction on US 60 and turn north on CR A5 for 4.5 miles. The journey south on NM 32 from Quemado to Apache Creek reveals a continuously unfolding array of landscapes. Twenty miles south of Quemado, NM 103 branches east into the Apache National Forest and Quemado Lake Recreation Area, which has campgrounds and hiking trails. NM 32 continues climbing south to a lone aspen grove at the 8,200-foot pass called Jewett Gap. With soaring peaks on either side, the route slices through the 9,300-foot-high volcanic arc of the Gallo Mountains and plunges into Apache Creek Canyon. Intricately carved towers and sheer basalt walls in this gorge shelter Apache Creek’s idyllic, 10-mile riparian corridor, where lush wildflower meadows and diverse forests create stunning seasonal colors. NM 12 and NM 32 meet at the confluence of the Tularosa River and Apache Creek, where you’ll find a small store and a gas station. The nearby Apache Creek National Forest Service campground offers creek-side walks and the Apache Creek Interpretive Trail, an easy one-mile loop. Above: Catron County&apos;s scenery stuns, from the Sawtooth Mountains to Quemado Lake. The Catron County seat of Reserve is another 12 miles south on NM 12. If you stop here to fuel up or spend the night, be sure to check out the statue honoring former Socorro County sheriff Elfego Baca. During one of the Old West’s most famous gun battles, in 1884, he single-handedly held off dozens of cowboys seeking revenge for the arrest of their friend. From Reserve, mature forests hug the river all the way past Apache Creek to Aragon, founded in the late 1880s at the old Fort Tularosa site. Don’t miss the parking area for the Continental Divide National Scenic Trail. (Get out of your car and let your boots claim at least a little of the 3,100-mile CDT!) Keep going east on NM 12, following the southern branch of the Hoof Highway through rugged mountains to the north and breathtaking views south across the Plains of San Agustin, back to Datil. While services are spread out across Catron County, you’ll find lodging, dining, campgrounds, and hiking trails all along the triangle. The Eagle Guest Ranch has an eight-room motel, a well-regarded steak house, a store, and a gas station (575-772-5612, on Facebook). The BLM’s Datil Well Recreation Area, just a mile west of town off US 60 or NM 12, boasts one of the original 15 water wells along the Hoof Highway. Take the campground trail to scenic vistas and wildlife sightings (575-835-0412, blm.gov/new-mexico). The Pie Town Pie Festival (pietownfestival.com) draws big crowds in early September, but local eateries cater to pie- heads for much of the year. (Call ahead in winter months.) 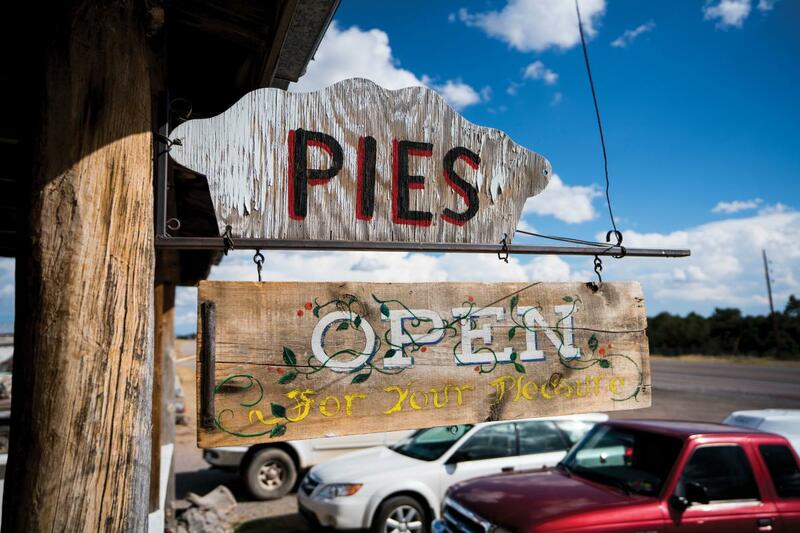 The Gatherin’ Place (575-772-2909, on Facebook), Pie Town Café (575-772-2700), and Pie-O-Neer Pies (575-772-2711, pieoneer.com) are all on the main drag. Stop on the side of the road and gawk at the outdoor Windmill Museum, one of the coolest little “roadside attractions” anywhere. The Largo Motel and Café combines 20 basic but comfortable rooms with a popular café that includes a salad bar and house-made cinnamon rolls (575-773-4686). Walter De Maria’s Lightning Field, an internationally known installation of 400 steel poles meant to be viewed and walked through, books up its overnights quickly. Call the Dia Art Foundation’s Quemado office, open from May to October (505-898-3335, diaart.org). The Quemado Lake Recreation Area, in the Gila National Forest, features five campgrounds and seven hiking trails (nmmag.us/quemado-lake). The Catron County seat offers groceries, gas, dining, and lodging. If you’re hungry, try the Adobe Café and Bakery (575-533-6146), Adobe Does Barbecue (505-533-6145), and Ella’s Café (575-533-2111). The Hidden Springs Inn, next to the Adobe Bakery, has seven rooms, each with its own unique decor and theme (575-533-6146, thehiddenspringsinn.com). Find a variety of rooms, cottages, and an RV park at the Frisco Lodging Company (575-533-6600, friscolodgingnm.com). The Quemado Ranger District Office has information on camping and hiking in the Apache National Forest (575-773-4678, nmmag.us/usfs-quemado). The Magdalena Ranger District, in Magdalena, oversees the Cibola National Forest, which encompasses the Datil, Bear, San Mateo, and Magdalena Mountains, with abundant hiking, camping, and rock-climbing options (575-854-2281, nmmag/usfs-magdalena). The Socorro Field Office of the Bureau of Land Management can provide information on the Eagle Peak and Mesita Blanca Wilderness Study Areas and the Datil Well Recreation Area Campground (575-835-0412, nmmag.us/blm-contact). Bring extra water, food, hiking boots, blankets, and first-aid supplies as well as a spare tire and a full gas tank before driving the backcountry. Avoid unpaved routes after rain or snow. Invest in a GPS device.